Wizard World brings Comic Con to St. Louis for the first time! Join us in booth 101 & 103 for a book signing with authors Sharon Shinn (The Shape of Desire, Troubled Waters) and Angie Fox (The Accidental Demon Slayer). Books for signing will be available for purchase in the booth. For details on St. Louis Comic Con ticketing and programming, visit http://www.wizardworld.com/home-stlouis.html. Wizard World brings Comic Con to St. Louis for the first time! Join us in booth 101 & 103 for a meet and greet with Laurell K. Hamilton (Anita Blake: Vampire Hunter series) and a book signing Sharon Shinn (The Shape of Desire, Troubled Waters). Books by both authors will be available for purchase in the booth, and Laurell's will be pre-signed. For details on St. Louis Comic Con ticketing and programming, visit http://www.wizardworld.com/home-stlouis.html. STILL LIFE WITH SHAPE SHIFTER is the second book in the Shifting Circle series. Melanie Landon has spent most of her life concealing the fact that her younger sister, Ann, is a shape-shifter. So when reporter Brody Westerbrook shows up at her door armed with the truth and saying he wants to write a book about these magical creatures, she’s terrified. But soon Melanie has even more to worry about—Ann, who has been missing, returns with a shape-shifter boyfriend in tow. It’s also clear that Ann is very sick—and Melanie has no idea how to save her life. Copies of STILL LIFE WITH SHAPE SHIFTER, SHAPE OF DESIRE and other Sharon Shinn novels will be available for purchase and singing at the event. As always, if you can not attend the event but would like a signed copy just let us know! 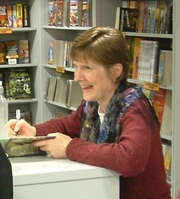 Sharon Shinn is currently considered a "single author." If one or more works are by a distinct, homonymous authors, go ahead and split the author. Sharon Shinn is composed of 4 names. You can examine and separate out names.